It took me just over a quarter of David O. Russell’s American Hustle to realize that something else was going on entirely. What I expected was: ‘Oh formula, common-genre, Casino redux with Bale as De Niro.’ And Bale is De Niro, on purpose, but his appearance is 100% Tony Clifton. It would be easy to see the extensive employment of so many hallmarks of American culture as homage, but what’s going on is far more faceted. The larger statements of American Hustle wade into theory about art: about sincerity, authenticity, and irony. For anyone that has read it, not recalling Lionel Trilling’s book “Sincerity and Authenticity,” during American Hustle, is nearly impossible, as well as Susan Sontag’s wonderful essay, “Notes on Camp.” In modern film, where does the sincerity begin and authenticity end? Which is being sacrificed for which, and what is the larger statement? Why do audiences expect entertainment to be hyper-realistic, even when employing genre or fantasy? Where is the artifice and to what end? Why do we ask to get “lost” in film, to perceive it as a reality and suspend disbelief and how far do we really expect that to go? Where do reality and entertainment meet, and why do we need them to meet? There are stellar of moments of watching Russell exploit artifice to the end of placing all of the above questions squarely in the lap of the audience, whether they know that they are ‘Seeing what they want to see,’ or not. Wonderfully, the heavy stage makeup of Renner and Cooper is regularly visible on their collars. This presents a moment for the audience to make a decision: look past it as a production mistake and stay immersed in the narrative, or observe that Russell is pulling the film down on itself. It was said recently by two actresses (Sarah Michelle Gellar and Lizzy Caplan) at a panel on women in TV, that TV allows for 3-dimensional female characters, which is why they prefer the medium. Gellar stated: ‘In movies you can be the wife, the daughter, or the girlfriend, and those roles don’t allow for much development.’ It’s a true statement, which is why Amy Adams and Jennifer Lawrence, (as well as Elizabeth Rohm) are so towering in these roles. They are multi-faceted… finally. Compared to the men, they are far more realistic – flawed and gifted and charming and terrible at once. By flipping how genders are usually portrayed, Russell allows the women to be the center of the movie, and all gravity generated in the narrative is created by them. The male characters are the one dimensional, doing their best impressions of character actors. It’s perhaps the most important statement about what we expect to see / want to see, and what we are actually seeing. American movie-goers expect women as scenery, providing pure emotion in an inconvenient way for male characters, but what they get in American Hustle is the wonderful, terrible mess of Lawrence, and the gravity, intelligence and perception of Adams. In many ways, this is Adams’ film. I’m no student of all things Andy Kaufman / Tony Clifton, but with 40 extra pounds on him, Bale (visually) as Clifton doing De Niro is speaking volumes about entertainment, con-art, lying, impression, and authenticity. Throughout the film, women are physically removing his colored glasses, trying to get to the real person, but we can’t know what that means for Russell, or upon first viewing, us. Russell’s Hustle creates far more questions than it gives answers, but two sorts of audience members will walk out of the film: those that saw what they wanted to see – a fun rehash, and those scratching their heads, with a smile on their faces. Following is a blog post I wrote for Winged’s blog. The first time I got stung by a bee, I can’t be sure it was a bee. In retrospect it was likely a yellow jacket, but I can’t know. I remember it was a hot, mid-western summer day with insects screaming out their songs: “scKzzzzssT… scKzzzzzssT,” and I was small – probably 6 or so. I was standing in our narrow garage which was opened to the driveway. Likely I was deciding which vehicle I was going to take out for a spin: the Big Wheel, the pickle car (don’t ask), or the Green Machine. I was not a bike rider. My siblings’ bikes were always too big for me and I was fearful of the heavy frames and the extreme distance to the ground once seated; I wanted to be able to bail out with a soft tumble if need be, not take the hard fall on the concrete, yielding stinging, scraped legs and arms. Even at that raw age, friends and siblings had long warned me about the possibility of getting stung by a bee, so I wonder if I didn’t just want to get it over with. I had been promised by my friend across the street that the pain would be like death; that I would probably want to die. So that day when a bee flew in the garage and began inspecting me to see if I could possibly yield nectar or pollen, I panicked. I eschewed the instruction that had been drilled into me by my wise, experienced friends and siblings, being: Don’t move, and it will go away. Naturally, I moved. A lot. In a remarkable, small-child’s dance motivated by fear of an unknown pain. And I began swatting, a lot. From what I can remember, the bee or wasp stung me on the right arm. Growing up in suburban Chicagoland, there was almost no authentic relationship with nature; everything was abbreviated. The bug-spray truck drove down our street every summer night and we deeply inhaled that spray while trying to fall off to sleep. Our yard was chemically treated so no dandelions ever appeared. The corn fields at the mouth of our subdivision were sold and built up with houses before I was 10. Despite that, some of my most vivid and important memories are of the verdurous nature that I could find. I was fascinated when we studied milkweed pods in the first grade – the way they broke and gave up white fuzz. We had to wear rain boots that day which I didn’t have, so the teacher put garbage bags and rubber bands over my shoes and secured them up my legs. The same friend once insisted I borrow her extra pair of ice skates so we could go skating on a pond near our houses. It was the first time I had ice skated and with the snow coming down, it remains a favorite memory. That solid pond, the snow, layers of clothes, no one else around, the gray sky and the pond wrung around with dry straw weeds and tall brown grasses frozen into place. But by the time I was in highschool, nature had become a foreign locale. As it will, social life had long since taken over as wholly enthralling. At one point my group of friends got really into camping and going away for the weekend. On one trip to Devil’s Lake, everyone decided to go hiking which would involve some basic rock climbing. I eagerly set out with them. My friend Nick, looking down at my shoes, said, “…are you going to wear those?” I shrugged. I had no idea that black and white patent leather wingtips (with leather soles) might not be ideal hiking wear. I somehow managed to hike like a champ with those lovely dress shoes on. Before I moved to Portland, Oregon, in 2006 the three geographic choices that were before my boyfriend and I were: Portland, New York, and Philadelphia. I advocated for Portland, as I wanted to live somewhere exceptionally beautiful and I was tired of large-metropolitan city life. Chicago had wrung me out. I was depleted, afraid of how hardened I was becoming, and fearful that I couldn’t easily turn off my accent at will. Upon arriving in Portland, the town was beautiful. I tried to be in love with it or at the very least, meld into it; its newness, fuzzy green firs towering, lush green expanses, welcoming, young population. The relationship I was in quickly fizzled. In one version of the story, the one my friends tell for effect, I dumped him and took his job. The truth is more faceted, but the result was the same. Spring in Portland is a sublime impossibility, holding the violent bloom of the season against the ache of winter breaking, in one unbelievably sustained note. There are sheer months of walking on beds of petals while the trees billow timid, earnest fragrances. Fall in Portland is equally protracted; months of walking on one long carpet of wadded orange leaves. Residents rake giant mounds into the streets so cars can’t park. It was in Portland, one autumn day in 2008, that a bee flew into the apartment that belonged to my new husband and I. We had met at an antiques show the year prior; we had only been married a few months. The bee had flown in through a wonderful old kitchen fan vent and was resting on the counter. My instinct was to find a cup and paper lid to catch and put her outside. But it was a gray and cool day and my husband knew she was exhausted and cold. He had the good mind to heat a plate by running warm tap water on it, drying it off, and dropping a little honey on it. We put the plate near the bee. She quickly smelled the honey and ran over. As she lapped up the drops, she began flexing her wings and abdomen and warming up. We moved her on the plate to the front doorstep and watched her. She ate some more, cleaned herself, and zipped off into the air, but before she left she very clearly hovered and looked around, orienting herself and noting the location. The next day when I opened the door to leave for work, about a dozen bees were pelting the screen trying to get inside because that’s where they had been told the honey was. The next week we had our first bee hive. It is said by many beekeepers that the bees choose us, we don’t choose them. People long-fascinated by bees generally have some kind of memorable experience which serves as a final motivation to start keeping bees. Personally, I was rather anti-bug as a child and adult, but then, most of my encounters were with mosquitos, house spiders, or later, gigantic silverfish that continued to crawl even after being smashed in half when living in Chicago. Bees are quite different. Bees have moods and cycles that they will make you aware of. While largely indifferent to their keepers, they will happily inform you when you should leave them be and show clear signs when something is wrong. Bees in no way need us, but we most definitely need them. The first time that I’m sure I got stung by an actual honeybee, I was on a swarm call a couple of years ago. Swarms are exciting and generally extremely easy to catch. Bees swarm when the population of a hive grows too large for all of the bees to thrive so the mated queen leaves with about half of the colony to establish a new home. 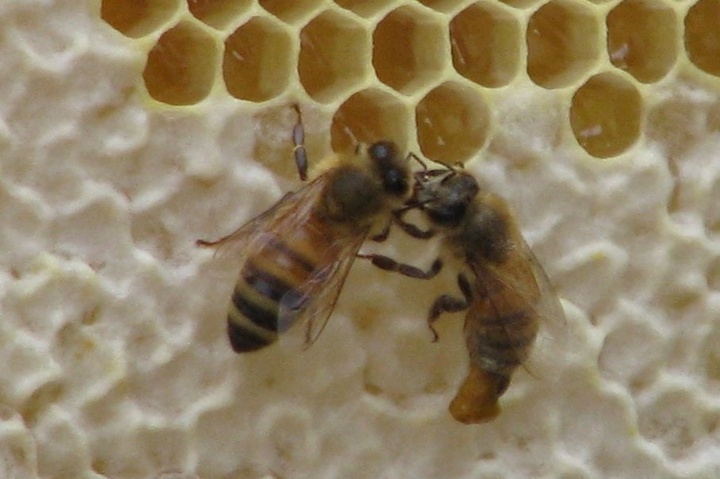 The virgin queen remains behind with the rest of the colony, honey stores, and the brood. She is set up to succeed. Swarming is a natural means of reproduction and propagation and because the swarmed bees have no brood or honey to protect, they are generally quite docile. For this reason, I tend to get risky with the protective gear. As long as my face is covered, I generally feel like I’m good. At some point during the catch I had taken off my gloves while speaking with the homeowner, and waiting to give the branch the swarm had collected upon another firm shake in order to drop the bees into a box below. But as I walked up to the swarm to monitor their state, one feisty, flying lady landed on my hand with a single mission: she immediately stung me, and died. Unlike the ensuing meltdown I no doubt had when I was young and had gotten stung, I was so fascinated by watching the bee sting my hand – her rear and abdomen ripping off and the stinger remaining behind – that I forgot about the impending rush of pain that would inevitably occur once her venom pumped in. And that pain did occur, but it wasn’t nearly as bad as the next two days, and the ceaseless itching that occurred. I often try to think of what small Jill would think of adult Jill. I think in a lot of ways she would think adult Jill is kind of a badass; I think that young Jill is very proud of adult Jill. Young Jill would be wholly impressed that adult Jill is a writer, a teacher, an artist, and gamer (young Jill loved Atari). She would love how much time adult Jill has spent in school. She would probably also think adult Jill was slightly unhinged… what with the lack of food-related limitations and repulsions, and making a life and living out of bees and beekeeping. And she would think it was weird that the homemade bee costume I wore in grade school panned out to mean something – to be a kind of epic foreshadowing, and that despite the somewhat hermetically-sealed suburban and then urban existence I’ve had, the bees chose me.